It doesn’t matter if you visit for a day or a year; travelling Iceland is always going to be a rewarding, exciting, life-changing experience. If you don’t have a full week on your hands, fear not! You can still experience this incredible country for yourself without missing any of the powerful waterfalls, stunning glaciers, and jaw-dropping views that make the Land of Ice and Fire famous world-wide. If you’re looking to fit in a lot of Iceland in a shorter amount of time, travelling along the South coast is a great option. This will allow you to see Iceland’s iconic hotspots without having to travel for very long! Beginning in Reykjavik, this five-day tour with Arctic Adventures does just that, and we think you’ll agree that it more than delivers on everything you think when you think about Iceland! Here’s the best part about Iceland: those pictures you’ve seen on Instagram, the videos you’ve watched on our channel, the ideas you have in your head about what kind of adventures you could have there? They’re all exactly what you’ll get when you visit! Begin your adventure by walking along craggy cliffs, explore 8000-year old lava caves, and climb mountains while hoping for a glimpse at the Northern Lights. It wouldn’t be a visit to Iceland without a few hot springs, right? Thankfully, on this itinerary, you’ll find more than a few. Deildartunguhver Hot Spring, the most powerful in Europe, provides the heating for every nearby village, and standing by it is the perfect way to warm up on a chilly Icelandic day. Can’t get enough of Iceland’s natural power? Wait until you see their geysirs. Who says Iceland isn’t a beach destination? While you likely won’t be relaxing in a bathing suit, Iceland’s beaches are unique and eye catching. Enjoy a stroll along a pebble beach, or, for a truly Icelandic experience, check out one of the country’s world-famous black sand beaches! No matter where you go in Iceland, it takes no time at all to fall in love with the country. From the friendly locals to the heart-pounding activities to bucket-list-worthy views like the Northern Lights and ancient glaciers, there isn’t a single part of this beautiful country that won’t amaze you. 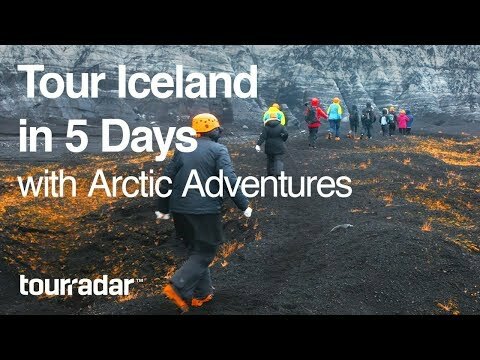 If you can’t wait a second longer to plan a trip to Iceland, check out this Itinerary and others like it over at TourRadar!